You can manually change the name of a sheet within Excel by clicking Format O Sheet O Rename. Excel highlights the sheet name tab. Click the tab and type the new name. After you modify the name, click elsewhere on the sheet and Excel updates the sheet name. Because users can easily modify the name of a worksheet within Excel, be careful when referencing sheet names with your macros. If you attempt to reference the name of a sheet that has a changed name, Excel returns an error message. 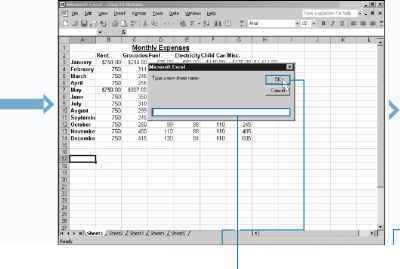 No matter what its name, Excel still keeps track of the sheets based upon the order in which they exist within the Sheet Collection. If you use the Project Explorer to view the list of sheets in the workbook, you see listings of Sheet1, Sheet2, and so on, with the corresponding sheet name in parentheses. You can also use the Name property in conjunction with the Parent property to determine the name of the workbook that contains the current sheet. You can use this Name property function to ensure that you are in the appropriate workbook before executing the contents of a macro. You determine the name of the corresponding workbook using the code CurrentWB = ActiveSheet.Parent. Name. S Switch to Excel and run the macro. 0 Type the desired sheet name in the input box. -■ The name of the active sheet changes to the name specified by the user. You can save a specific sheet in your workbook with the SaveAs method. You can use this property with a Sheets Collection object, which enables you to save any sheet. You can also use the property with a specific Worksheet or Chart object to indicate a specific workbook or chart that you want to save. FileName, FileFormat, Password, WriteResPassword, ReadOnlyRecommended, CreateBackup, AddToMru, and Local. You use the FileName parameter to specify the file name and location where you want to save the selected sheet. If you omit this parameter value, Excel utilizes the filename of the corresponding workbook as the value for the FileName parameter. If you do not specify a path as part of the filename, Excel saves the file containing the sheet in the current folder. You use the FileFormat parameter to specify the file format for saving the sheet to a file. You save the sheet to any of the file formats supported by Excel with one of the xlFileFormat constant values. See Appendix A for a list of the xlFileFormat constant values. If you do not specify a FileFormat parameter value, Excel uses the default value. The default value consists of the last specified file format you used to save a sheet as well as the version of Excel you use for new files. For example, to save a sheet to a Text file, you use the xlTextMSDOS XLFileFormat constant value. With the Password parameter you can specify up to a 15-character password for opening the file. You use the WriteResPassword parameter to restrict the file to open as read-only without the password. The other parameters accept Boolean values of either True or False. ^ Create a new subroutine. —0 Type ActiveSheet.SaveAs, replacing ActiveSheet with a reference to the sheet you want to save.